The whole centre has been on a craft and colour high these last three days. 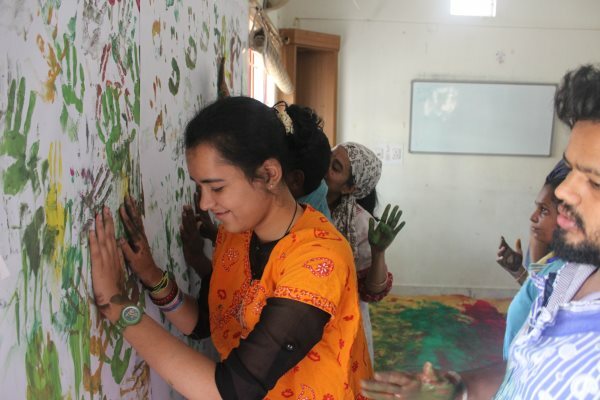 There has been a flurry of activity – facilitators running up and down the stairway while carefully setting up different rooms for different adventures; children splashing their hands and feet in colours poured on the floor and then stomping and stamping around; mops, floors, hands and the undersides of feet being washed; rangoli and mehendi taking on dazzling new styles; marble play veering off into painting; lightroom-darkroom games reaching a new artistic levels through the use of puppets and play – and an overall celebration of learning and working together. 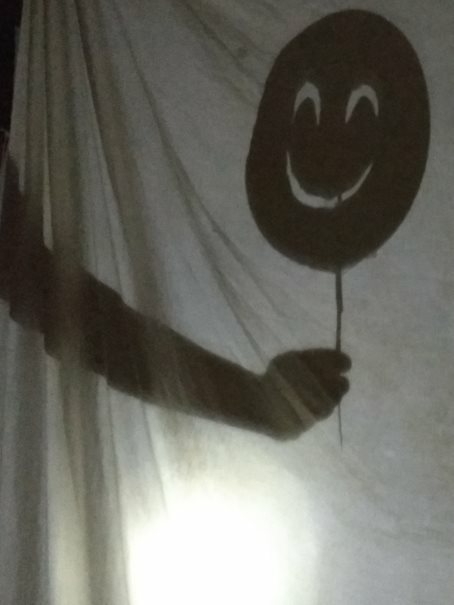 Bricolage 2019 started with an exclusive offering only for the children, three days ago. 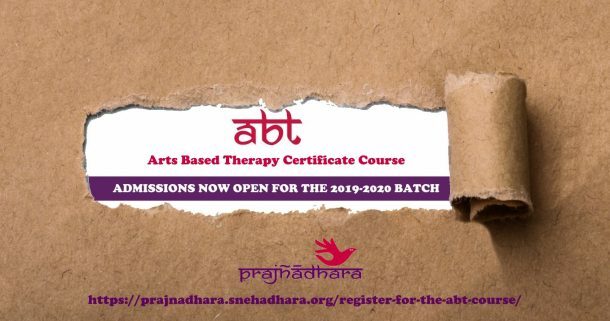 It has allowed for exploration of activities that the groups have not experienced first-hand or has given them chances to experience it in the company of new friends. The facilitators prepared the space the previous evening, taking more than one evening to design and plan the activity being offered. 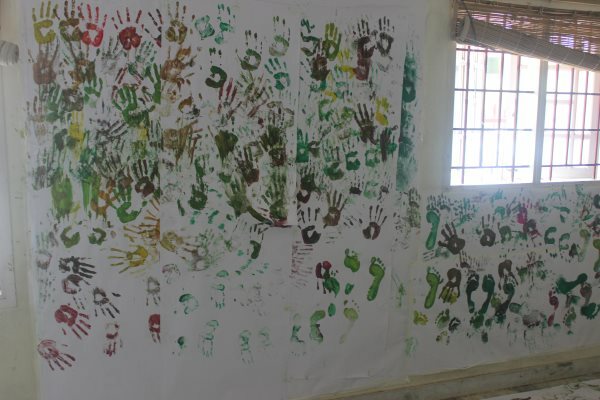 The rooms were set up keeping in mind the needs and learning goals of the children. 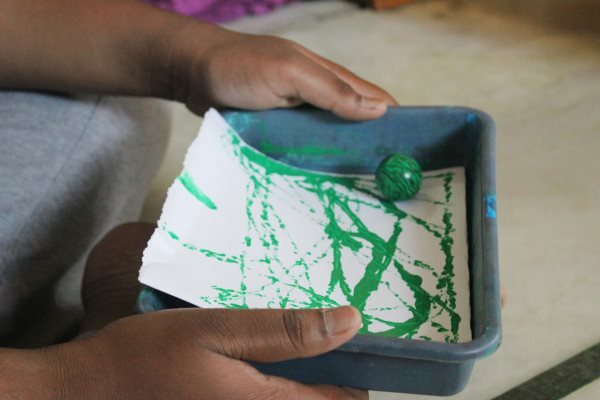 Day 1 of saw the children enjoying the marvel of marbles that glide across the floor, clink in the cup of our palms and roll on the surfaces of paint and paper with the same freedom. They followed the sound with their eyes and ears, while their fingers happily dabbled in paint as the marble rolled – making patterns on plain white paper. They used quilling needles to roll paper, pull out the rolls and stick them on little pieces of cardboard, prepared for card-making. The cards were happily taken away as gifts. Day 2 was a dazzle of light and darkness playing with each other. 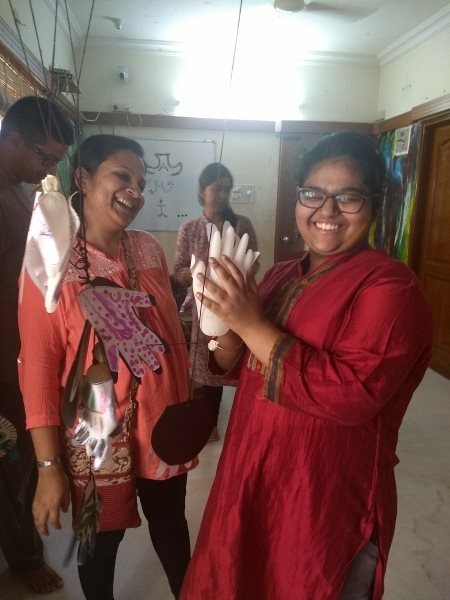 The excitement of preparing together was evident as the team collected and placed all the props from carefully made lists given by the puppeteer/ show director. Puppets were made, instruments placed just so and balloons stashed away strategically. The backstage was packed with goodies and every one of the five shows proved to be worth the elaborate preparations. 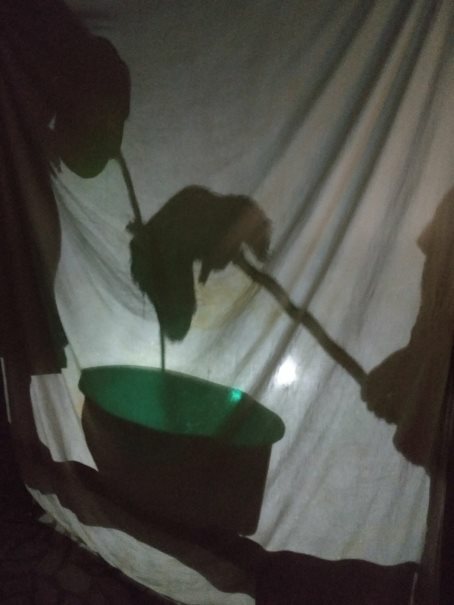 It was interesting to see how the children responded when the room was darkened. While some could not move from the edge of their seats as the screen lit up, a few were restless and walked around or wanted to do some direct investigation about the sandwich being featured in the light show. Mouths did indeed hang open in wonderment. 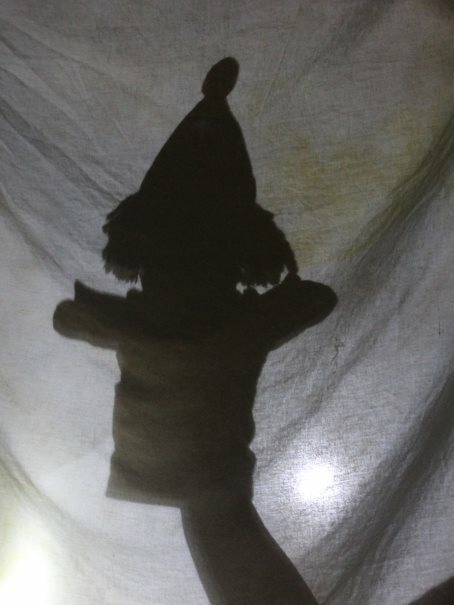 Routines were recognised from the play being shown and small learning shifts made, even if momentarily. The co-facilitators roped in for backstage duty during the show also jumped into the play with gusto. 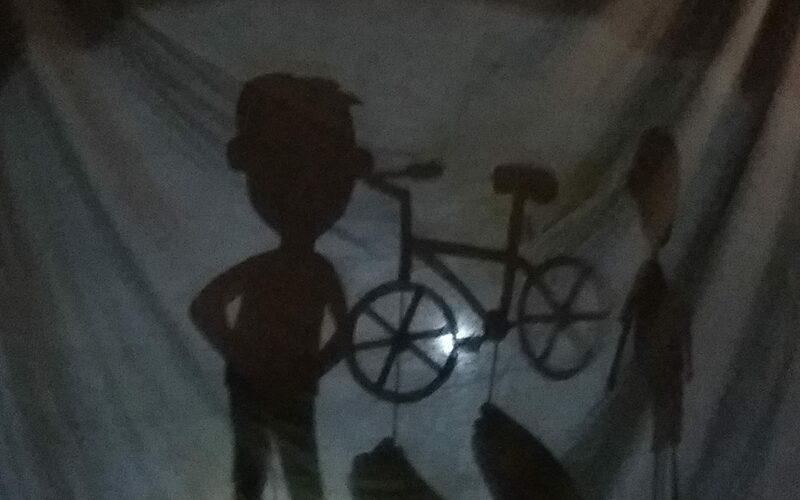 The stories that emerged – of Horse, Monkey, the Boy, sandwiches and a cycle – were rich and entertaining. The joys of pouring and splashing around in paint marked the afternoon of the second day. Stepping on paint and being asked to walk all over freshly laid out white paper can bring its own unbounded joys. 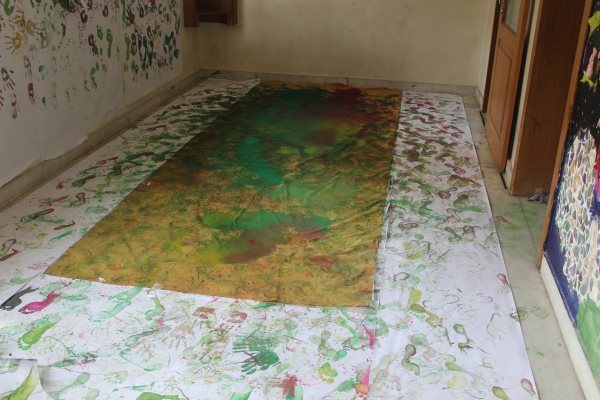 Handprints and footprints spread out on the floor and walls as facilitators and children went all out to find out what colours emerge when pink, green and yellow mix. Scouring the floors later and putting away the printed rolls of paper were tasks in themselves but no one who had participated in the visual art treats minded. 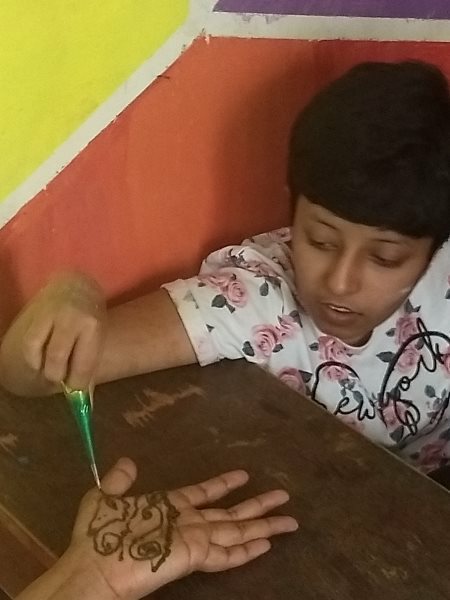 Day 3 was about finding the wrists, eyes, palms, ankles and elbows through tattoos and mehendi art. 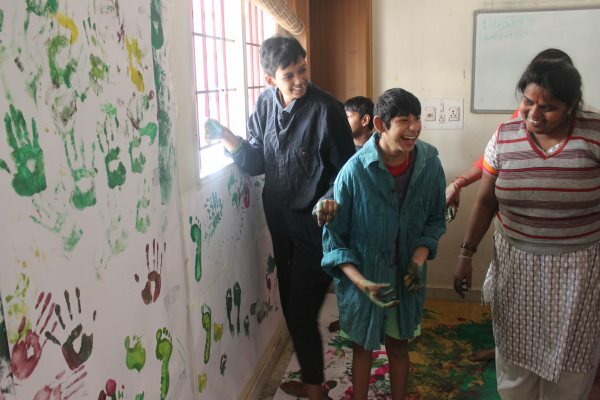 The rangoli sessions provided rich textures of experience and opportunities to spread coloured powders on the floors, with or without adhering to patterns or moulds. The sheer pleasure of watching sparkling powder pour through the fingers was chosen over joining the dots and making precise rangolis on the floor. 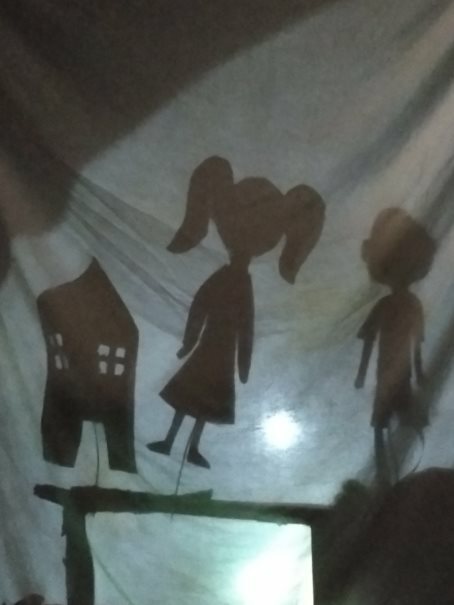 Bricolage is turning out to be a textured and nuanced experience, the impressions of which will be found over the coming years – in sessions and plans for the children to learn even as they play together.